“I feel my ERP is not doing a great job.’ If you have been thinking on the same lines, then you are one among the 75% of the people who would agree with you. While ERP streamlines your organization, there are barriers that stand in the way of the attaining better efficiencies. So, have you been searching for answers to overcome the challenges of your Sage100 ERP system for your e-commerce website? Here is a solution for you! Let us first take a peek into the challenges faced by e-commerce companies with their Sage100 ERP system. As an e-commerce company effectiveness and the efficiency of your ERP system directly corresponds to a good or bad customer experience. However, the coherence of your ERP system is undermined by the below challenges. A large customer database is one of the key aspects of an e-commerce company. Most of the e-commerce companies face issues with data synchronization between their ERP system and e-commerce platform. The uneven data distribution across the two systems affects overall functioning leading to the bad customer experience. For instance, a customer’s data is not updated on the ERP system even after a request is raised by the customer. There comes an issue of data discrepancy. Integration is considered as one of the top three challenges of an ERP system. With no proper integration between the Sage100 ERP system and Magento Platform, your company can’t provide updates to customers. If a customer finds that the product he’s been looking out to purchase is out of stock, you might lose out on a customer. There is a high probability, the customer might never return. In the highly competitive e-commerce market, are you will risk losing a customer? So, what can you do about it? 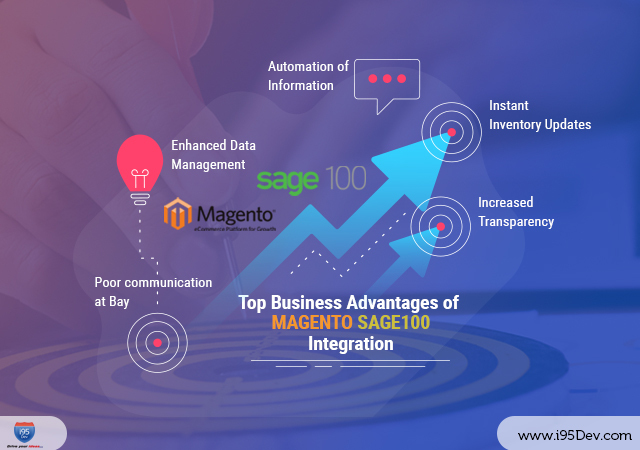 You can integrate your Sage100 ERP and Magento e-commerce platform using the Magento Sage100 connect. Now that you know about the challenges, let us see what challenges integration can address. Firstly, the most common issue integration addresses is that of data management. Though a company uses multiple data sources, the ERP system will be the go-to source. Integration helps in saving a significant amount of time. It also eliminates any kind of data duplication and caters for the elimination of dual entry. Integration facilities data searches in various places for similar data records. You can stop worrying about the data not being updated, sounds cool, right? There will be a frequent update between your Sage100 and Magento platforms and you will witness a seamless data transfer. Integration also increases the transparency as the teams are not kept in the dark due to frequent updates on both the systems. Magento sage100 connect provides a two-way integration and the information is synced on both the systems. Let us consider the manufacturing scenario and see how this works. ERP system helps you with both forward and backward tracking. The information can be an account from the beginning to the end of the process. With integration in place, traceability and accountability will become easier for the manufacturing industry. The same is true for other industries too. The golden rule for managing an inventory is finding a balance between having surplus or deficit. Maintaining the right quantities of inventory ensures you have sufficient inventory in place to meet the demands of your customer. Companies calculate their lead time based on the inventory. So, a constant update on the inventory numbers becomes essential for the companies. So, will integration solve this issue for you? We would answer in affirmative! The inventory management of an ERP system assures transparency in the inventory quantity. The moment you receive an order, the inventory quantity is instantly updated on the ERP system. Any updates on the inventory quantity on the ERP system is instantly updated on the Magento platform. In the case of product unavailability, the inventory is instantly updated and the status of the product is changed to out of stock on the Magento website. Also, read how you can manage inventory with magento sage100 connect. Consider, you have integrated your Sage ERP system and Magento. You are now in control of inventory management and shipping. You are constantly updated with order status and the expected delivery date. With constant information within your reach, it becomes easier for you to communicate the same to your customer. This acts as a catalyst for better customer experience. What more would you want if you have a customer who is satisfied? Integration between Sage ERP and Magento also helps you set automatic price changes, instant information updates across both the systems. You can leverage real-time reports and data updates for better data visibility. The database is updated accurately and automatically in real-time on both the ERP system and e-commerce platform. You can determine summaries and target projections with these real-time updates and analytics. We have seen all the issues Magento and Sage100 integration can solve for us. While you might be considering integration for your e-commerce website, here are 3 things your boss might be looking for in a Magento Sage 100 integration platform. i95Dev provides a seamless integration solution to handle your Sage100 ERP challenges. Our solution is more than a data-mapping tool. We understand your business requirements and don’t compromise on business workflows. We customize the solution to meet your integration requirements. Talk to us today if you would like an enhanced ERP experience.